Hijiki seaweed salad is a combination of hijiki seaweed, vegetables, and spices. 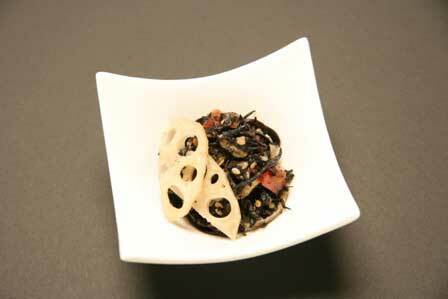 The vegetables include lotus root, lettuce stem, bell pepper, red pepper, and sesame seed. The hijiki seaweed itself is harvested in Japan, and the finished product is processed there as well. Hijiki seaweed is dark purple to almost black in color, and consequently the salad, taken as a whole, has a very dark appearance. The hijiki is very firm in texture.